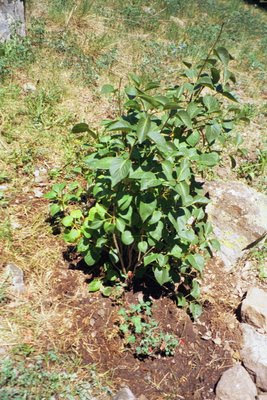 Today we placed Mom's ashes in the soil under the small lilac bush that I transplanted near her cabin yesterday. The service was just before sunset, after Jim and his boys had been fishing in the lake. I read from the Episcopal Book of Common Prayer, The Burial of the Dead, Rite One, including the Commendation and the Committal. "O God, whose mercies cannot be numbered: Accept our prayers on behalf of thy servant Evelyn, and grant her an entrance into the land of light and joy, in the fellowship of thy saints; through Jesus Christ thy Son our Lord, who liveth and reigneth with thee and the Holy Spirit, one God, now and forever. Amen." o soon it passeth away, and we are gone. Grant us grace to entrust Evelyn to thy never-failing love; receive her into the arms of thy mercy, and remember her according to the favor which thou bearest unto thy people. Amen." Into thy hands, O merciful Savior, we commend thy servant Evelyn. Acknowledge, we humbly beseech thee, a sheep of thine own fold, a lamb of thine own flock, a sinner of thine own redeeming. Receive her into the arms of thy mercy, into the blessed rest of everlasting peace, and into the glorious company of the saints in light. Amen. and the one that cometh to me I will in no wise cast out. by God's spirit that dwelleth in us. and at thy right hand there is pleasure forever more." Then I opened the plastic bag with her ashes, about five pounds in weight, poured them into the ground under the branches of the lilac bush, and asked Tom and Greg to help me scoop earth lying nearby (from planting the bush yesterday) and place it over her ashes. We did that and then covered the fresh earth with sections of sod that had been growing there. "In sure and certain hope of the resurrection to eternal life through our Lord Jesus Christ, we commend to Almighty god our mother and grandmother Evelyn; and we commit her body to the ground; earth to earth, ashes to ashes, dust to dust. The Lord bless her and keep her, the Lord make his [sic] face to shine upon her and be gracious to her, the Lord lift up his [sic] countenance upon her and give her peace. Amen." The God of peace, who brought again from the dead our Lord Jesus Christ, the great Shepherd of the sheep, through the blood of the everlasting covenant: Make you perfect in every good work to to God's will, working in you that which is well pleasing in his sight; through Jesus Christ, to whom be glory for ever and ever. Amen. O God, whose blessed Son wa laid in a sepulcher in the garden: Bless, we pray, this grave, and grant that she whose ashes are buried here may dwell with Christ in paradise, and may come to thy heavenly kingdom; through thy Son Jesus Christ our Lord. Amen." For me, reading these beautiful words and putting Mom's ashes to rest in a place of such beauty, was a joyous experience, filled with awe and a sense of God's presence. Jim was sad and a bit choked up, said he did not want to see her ashes. "You don't have to look," I told him. "This is a very beautiful and happy time for me, but you have a right to have your own feelings about it, to be sad." Tom and Greg, ages 18 and 14, were quiet; I wasn't sure what they were feeling. 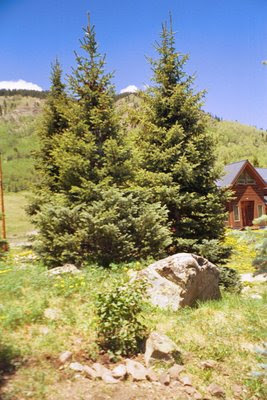 At any rate, we left her ashes there, near the ashes of her father, which were placed next to a one-foot tree on a knoll behind the cabin in 1976, and the ashes of her mother, placed there in 1984. We left behind her ashes, guarded by the little lilac bush with the three red columbine plants blooming next to it. Jim and Greg cleaned the ten fish they had caught in the afternoon, while Tom and I drove over to my house to fix dinner. I am confident that she rests in peace, back in Colorado at last, forever.